PHOTO CAPTION: "Photo Courtesy Seattlepi.com." Comic by David Horsey. This image was used with material permission. 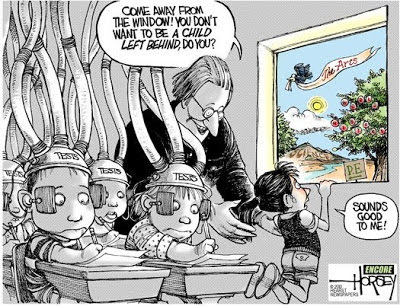 Sometimes schools put so much emphasis on test scores that students are not allowed to enjoy learning. The focus becomes doing well on tests and not developing the child's interest for learning and exploration. Not all children learn in the same way and not all children respond in the same way to a controlled environment. It is important to think about what is the best way to help children develop a love for learning and meet them where they are at. I think we will improve students learning potential when the focus is on connecting with students and including them in the process.